Strike Pro Kit From Alesis, A Professional Electronic Drum Set In The Mid-Range Price Class. They’ve Added Traditionally Sized Drums and Cymbals. Prepped All Pads with Mesh Heads. 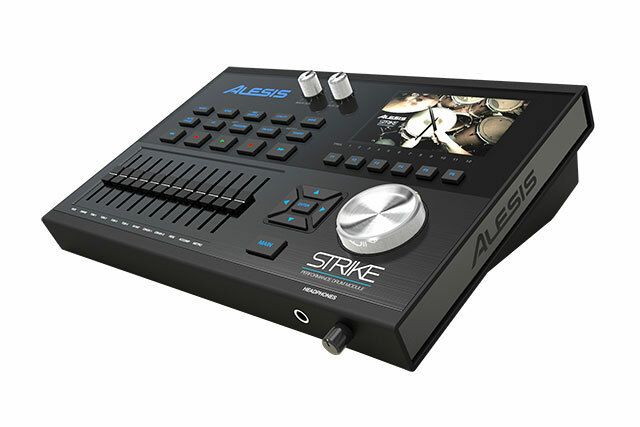 Alesis Have Stepped Up Their Game, Put Effort Into Acheiving That “Realistic Drum Feel” On Strike Pro Kit. Revealed by Alesis First at the NAMM Festival back in january this year. 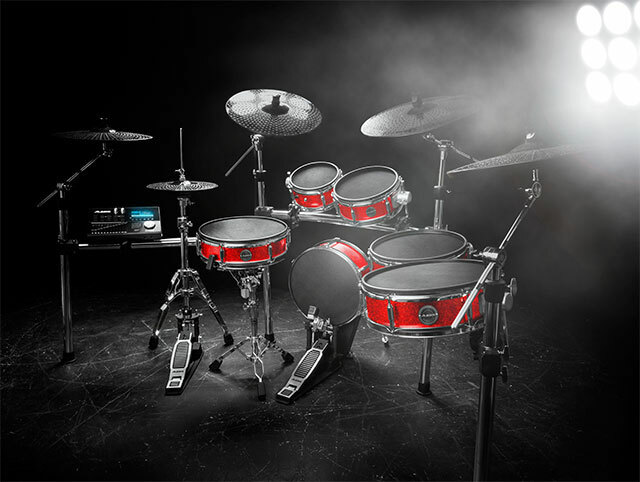 The Strike Pro Kit shatters all your pre-conceived notions about electronic drums. The Electronic Drum Set Strike Pro Kit combines the feel and familiarity of acoustic drums, with the versatility and capability of the best electronic drums. Strike Pro Kit are perfect drums to move beyond the limitations of a conventional acoustic set, without giving anything up. Featuring large dual-hoop pads, mesh heads and Patent-Pending sensitivity adjustment knobs. The Strike Pro Kit’s Premium Wood Shell Drums comes in Standard Acoustic Drum Sizes. Which Includes a 14” Snare Pad, 8-10-12-14” Drum Pads and a 14” Bass Drum Pad. All This In order For You To Feel “At Home” Once You Take A Seat Behind The Kit for The First Time. The Strike Pro Kit Cymbals: A 16” 3-zone Ride Cymbal. Three 14” Crash Cymbals w. Choke Capability. The 12” Movable Hi-Hat are An Exciting Step Forward. The Strike Performance Module includes a sound library with no less than 200 Drum Kits Made From 1000+ Multi-Sampled Instruments. Strike Kit Pro‘s Drum Module incorporates a On-board Sampling Capability. It allows you to store all saves on a SD Card. A USB/MIDI Connectivity can Easily Be Used in Conjunction with your Favorite Music Production Software. As this wasn’t enough, Strike Perfomance Module also includes the Built-in, Powerful Strike Software Editor. Strike Performance Module offers a 4.3″ Color LED Screen Display where you can find All Your Settings, Do Your Choices Easilly. Large Dual-Hoop Drum Pads with Wood Shells, and Adjustable Mesh Heads. 14″ Bass Drum Pad. 14″ Dual-Zone Snare Pad (The 14″ Snare Drum Pad Exclusively for the Pro Kit). 8″,10″,12″, and a 14″ Dual-Zone Drum Pad. Notice: The 14″ Drum Pad Exclusively for the Pro Kit. 16″ Triple-Zone Ride Cymbal. Three 14″ Crash Cymbals, the “Strike Zone Kit” only includes one and 12″ Moveable Hi-Hat. Strike Performance Module with 4.3 Full-Color LCD Screen and Individual Outputs. All New Sounds, 200 Kit Locations and Over 1000 Multisampled Instruments. Software Editor for Creating Custom Kits/Instruments, and Importing .wav Files. The Estimated Time of Arrival (ETA) for Strike Pro Kit is currently set to August, 2016. Many people have been waiting Anxiously for this Release. It wouldn’t be surprising if Alesis decides to Release the Electronic Drum set a bit. As a release at the NAMM Show in June would not only give it a boost, but maximize the media exposure.